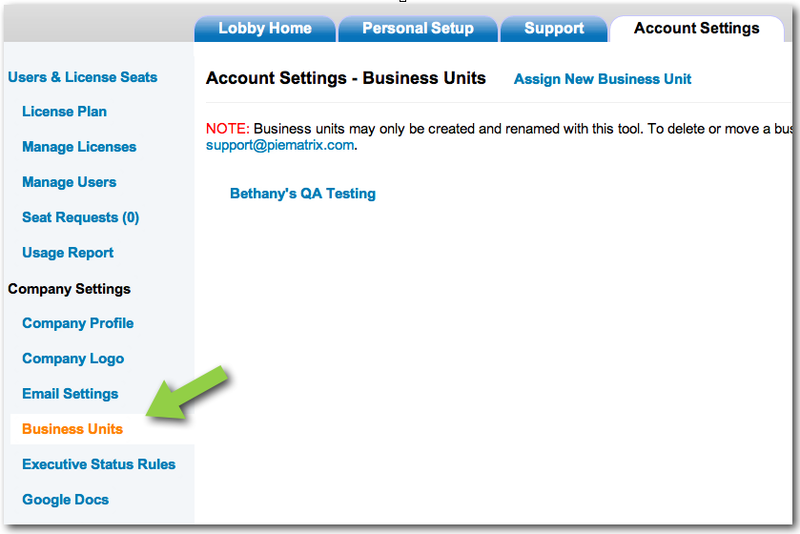 When we recently updated the Settings part of our PIEmatrix online project management platform, we made business units accessible to all of our customers. PIEmatrix has supported business units for a while on a requested basis, but now each organization can add and manage their own business units in their accounts. What are Business Units? Business units can be different functional groups within your company or organization. For example, they can be IT, Marketing, Finance, or HR. A business unit can also have child BUs. For example, Finance can have A/R, A/P, or Reconciliation. Business units can also be set up geographically, such as for the USA, Europe, or Asia. Each business unit can have its own pie templates and projects, and you can control what each user has access to by giving them different privileges in each business unit. Let's say we have a user named Sue, who works in the Human Resources department. You can assign Sue to the Human Resources business unit with full privileges, which would allow her to create templates and projects, assign people to steps, and edit the projects she's made. You could also assign her to the Marketing business unit as a team member user with fewer privileges. 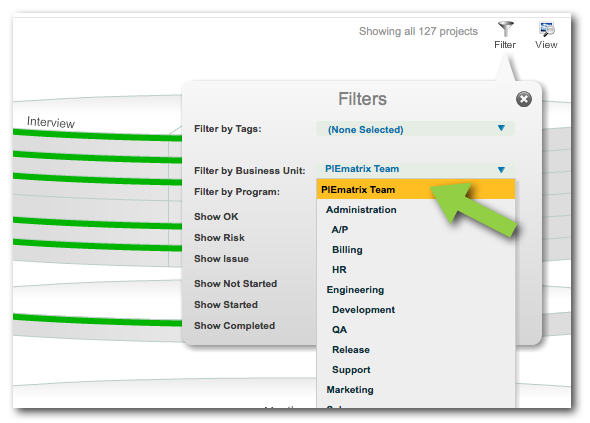 With business units, an executive or director can filter the portfolio of projects by functional departments using the business unit filter. This is very powerful since you can establish separate visibility for directors locally in each business unit, while the senior executives can oversee all business units with one view. This level of filtering provides another level of filtering on top of the great tagging feature. Business units are hierarchical, and a user in a particular business unit will only have access to content in both the unit they are assigned to, and to content in any business unit that is a child of their top business unit. They would not have access to content in any higher level business unit unless they were also assigned to those units directly. The only exception to this is that users with authoring permissions will see PIE templates from all business units (except for sibling business units), and all users will be able to see and access any project to which they are assigned. When the Business Unit page loads, click on "Assign New Business Unit", give your new business unit a name, and decide where you would like it to be within your organization. You can also give a description of how project sizes should be determined for your new business unit, but this is optional. You can add business units, or rename them by clicking the Edit button that will appear when you hover over one of your business units. If you need to move or delete a business unit, please contact PIEmatrix support at support@piematrix.com. Newer PostNot only schools, businesses too have killed creativity.